Wherever you're going and however long you'll be straying from home, there's no excuse for overpacking. So how to reduce the bulk? We pack with our iPad in mind. Whatever your device – iPad, iPhone or iPod touch – it's the smart way to dump your maps, books and travel guides without feeling stranded and lost. With an iPhone in your backpack, you can download the local Lonely Planet to iBooks, log on to a travel blog or check out a hotel's latest reviews, all while you're standing on its doorstep. The results that you get will be more relevant, more timely and altogether more useful. You needn't stop there, though. Swap your CDs for downloads and transfer a handful of TV shows and films, and even the longest flight will fly by, without you having to pay an excess for stuffing too much in your bag. You needn't finish your digital packing before leaving home, either. Open, wireless networks are becoming more common by the day – as is reliable 3G coverage – allowing you to buy new books, songs and even the latest edition of Tap! magazine as you travel. You can save money by emailing photos rather than sending postcards to your friends and family, and you can also update your online travel journal as you move from beach to beach, city to city or station to station. 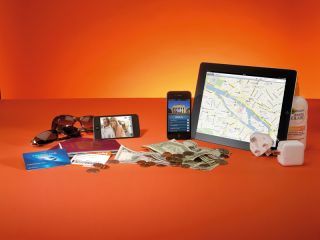 With summer in sight, we've dug out the best gadgets, apps and games for today's savvy traveller, and over the next nine pages we'll reveal the digital adventurer's perfect packing list. We'll also show you how to stay online and in touch overseas without busting your hard-earned holiday budget. Travel can take its toll on even the toughest tech kit, so don't skimp when it comes to insurance. Check your existing home and travel policies for any exclusions that might leave you out of pocket if you lose your device. Specialist agents such as Protect Your Bubble offer worldwide cover for water damage, theft or loss of an iPad starting at £4.88 a month. Similar cover for iPhones is offered by insurance2go.com from just £3.99 a month, or £34.99 a year, with an option to add cover for any unauthorised calls made on your account. Insurance won't help you recover your device if it goes walkabout when you're far from home, so register for Apple's free Find My iPhone service by following these instructions. It also works with the iPad and iPod touch. Once registered, your device can be tracked online, remotely locked and wiped to remove any sensitive data. You should also set the Passcode Lock (Settings > General > Passcode Lock) for the duration of your travels, so that nobody can gain access without entering a four-digit PIN. Make sure your data is backed up online by syncing with iTunes before you leave, and consider making an online copy of your essential data. The simplest way is to use Apple's MobileMe service (me.com), but at £60 a year it's far from cheap. A free alternative is to sign up for a Google account and follow these instructions to set up syncing on your iOS device. You can download new iBooks, albums and films as you travel, but this might incur fees if you do so on a foreign 3G or Wi-Fi network, so think about the books and albums you want to take with you and download them before you leave. You should also consider using Instapaper (free) to archive web pages you want to read later through the companion iOS app (£2.99, universal). If you're paying for web access by the minute, rather than the amount of data used, this lets you save money by archiving content to read offline when you're no longer being charged. If you're paying for a monthly contract, you'll almost certainly be able to use your iPhone or iPad abroad for browsing and email, and, in the case of the iPhone, for calls, too. Check with your network before you leave that you don't need your account unlocked for international use. If you're a pay-as-you-go customer, you may have to switch to a monthly contract before you can enjoy the same benefits. Your network may have a preferred local partner in the country to which you're travelling, through which you'll pay less than on the other available networks. Check whether this is the case before you leave and, if so, choose the preferred network through Settings > Carrier. If there's no preferred carrier, leave this option set to Automatic, so that your device can switch between them at will and you'll avoid the annoying 'network lost' pop-ups. If your device is unlocked – which it will be if you bought it direct from Apple – then consider buying a local SIM when travelling abroad. This will let you pay local charges rather than roaming ones for data services. Make sure you buy the right SIM for your device. The iPad and iPhone 4 use a micro SIM; the iPhone 3GS and earlier take a regular full-size SIM. Don't forget to take the SIM-changing tool from your iPhone or 3G-enabled iPad box with you. If you've lost it, you can use an unwound paper clip instead. Check out our tips for managing your overseas data use on p30 and see the table below for the best overseas deals.